US space agency Nasa has pinpointed the position of its robot explorer Opportunity, the second of two rovers which are now on the Martian surface. Images taken from space show the lander sitting in a tiny impact crater on Meridiani Planum, a flat plain rich in the iron-rich mineral grey haematite. Opportunity has also examined layered rocks in the crater and has found spherical granules embedded in them. They may have been formed by volcanism or by the action of liquid water. The granules are of a similar type to those shown to be lying loose in the crater when Opportunity took microscopic images of the soil. Scientists believe they originate in the outcrop and drop off into the soil as the rocky bedrock is eroded by wind. "[The outcrop] is very finely laminated. The thickness of the individual layers is a few millimetres at most. Embedded in it like blueberries in a muffin are these little spherical grains," principal investigator Steve Squyres told a news conference in Pasadena, California. 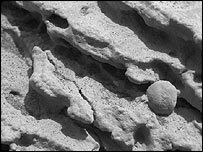 The spherical granules are a different colour from the rock "matrix" in which they are embedded. This suggests the grains might also have a different chemical composition, Professor Squyres said. Scientists had proposed that the grains were lapilli: ash particles from a volcanic eruption that coagulate to form small, rounded pellets. But this now looks unlikely. Alternatively, large impacting meteoroids could have melted Martian rocks, spraying the resulting molten material out as a fine jet which cooled to form a glass. Another explanation for the globules is that they are formed from dissolved material that has precipitated in the presence of water. Preliminary readings with the alpha-particle X-ray spectrometer (APXS) show rocks in the crater outcrop are loaded with the element sulphur. Data taken during Opportunity's descent to the Martian surface show the rover bounced 26 times after it touched down, finally rolling into a tiny crater on Meridiani Planum. "We rolled 200 metres, that's about one-eighth of a mile. And we rolled for more than one minute," said mission scientist Andrew Johnson. When it dropped on to the Martian surface, the lander was moving at a velocity of 9 m/s (20 miles per hour) north and 2 m/s (4.5 mph) west. The lander's final position closley matched predictions of where it would come to rest. 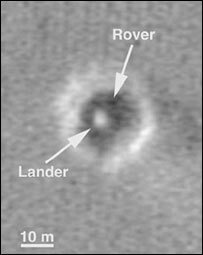 Dr Mike Malin, lead imager on the Mars Global Surveyor (MGS) spacecraft displayed images taken by the probe that show Opportunity's landing pad as a bright white triangle in the small crater where it stopped. A black shadow nearby appears to be the rover itself. Opportunity itself has looked above the rim of its crater and spied its protective backshell and parachute, discarded during landing. Opportunity's twin rover Spirit has now drilled into Adirondack, an American football-sized rock lying in Gusev Crater. Readings using Spirit's APXS show the rock is of volcanic origin, possibly a basalt.